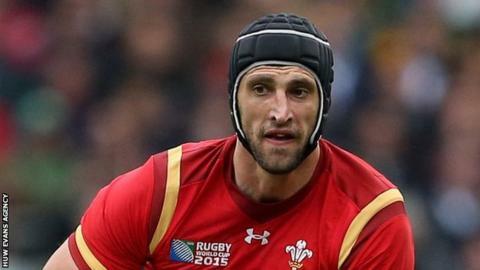 Wales lock Luke Charteris will join Bath from Racing 92 on a three-year deal at the end of the season. The 6ft 9ins second-row, who has 62 caps, will be out of contract at the end of the current campaign and so is free to sign for the Premiership side. Charteris, 32, left Newport Gwent Dragons for Perpignan in 2012 and then signed for Racing 92 in 2014. "It is such an ambitious club and that's a great atmosphere to be joining," said Charteris. "They put a lot of emphasis on player development, making sure that everyone is improving no matter how experienced they are, and that is a very exciting environment to be part of. "There is some incredible talent in the squad and I'm really looking forward to heading over and getting started." Gloucester had also held discussions with Charteris, while the Dragons had hoped to re-sign him. Charteris will join another Wales lock, Dominic Day, who signed a contract extension in January, when he moves to the Rec from his French club. After making his Wales debut against South Africa in 2004, Charteris featured in all five of Warren Gatland's side's matches at the World Cup. Bath head coach Mike Ford added: "We're delighted to have one of the best locks in the world join us, and he will help us keep improving and move quickly on to that next level. "Luke has been one of Wales's standout locks in recent years, and had a very good Rugby World Cup."